Browning is not only a brand but has become a lifestyle for some people. To support that lifestyle you can try to use browning home décor to create house that suits your lifestyle. However a lot of people do not know how to decorate their house with browning style. That is actually normal since browning is not originally a home décor brand; instead it is a hunting brand which provides a lot of hunting equipment and accessories. The home décor idea with browning theme comes out in the support of the brand and hunting lifestyle itself. Now let us learn more about this decorating theme and how to use it in your own house. The most important thing in using this theme in your house is by also using Browning home décor Buckmark logo in your house accessories. It is stylized as buck deer although it does not have any meaning, but the logo has become browning signature since 1978. Introduced late into the brand, the logo is now become a must have logo in all Browning items to show loyalty to the brand and lifestyle. You can find this logo not only in Browning original product but in a lot of home accessories and decoration you will use later. There is also buck and doe logo which symbolizes lovers, however this logo is only creative translation of the original logo. As browning has become a lifestyle, now there are a lot of house that using it has theme. If you want to apply this browning home décor theme, then you must also now its signature colors. The original colors are gold from the Buckmark logo with black background. However besides using gold and black you can also use other natural color such as brown, tan, khaki, and other brown shade that you wish for. Now there is even pink browning which mix pink color in the combination. Mix and match those colors inside the room and add the Buckmark logo which become the signature then you will be able to create the perfect browning theme house. Now let us talk about popular item in browning home décor and accessories. One of the most popular one is the bedding which has Buckmark logo as well as other signature color combination. Use this bedding to create your browning bedroom theme. Match it with black painted iron or wooden bed frame which will make the bedding appear even dramatic. Another popular browning home décor item is these bathroom accessories which come in full set and variation. You can get full set of bathroom accessories then match them with the towel set to completely decorate your bathroom with Browning theme. Do not forget to use brown shades inside the bathroom and you might even want to use wooden flooring. Brown shade that used in both the accessories and the bathroom itself will make your bathroom appear warm and comforting. You can also add pink browning as another hint of color which still matches well with your browning color scheme. 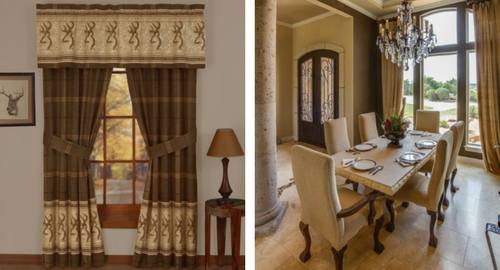 Complete your browning home décor design with several curtains which presented in the theme signature color as well as the Buckmark logo. You can put the curtain everywhere from your bedroom, living room even your bathroom since there is shower curtain with Buckmark logo which suits this theme. You can try to choose which shade that more suitable with your room color scheme since the color combination of these curtains are varied. You can even find curtain with the same color combination as your bedding to be used inside your bedroom. When you want to use browning as theme of your house, you should remember that most of the time the theme will use natural color especially brown shades. For some this color might be too dark, this is why you must make sure that there is enough light inside the room. It would be better if your house has big windows so natural lights can come inside the room. Try to bring the nature inside your house by adding some green plant to refresh the brownish look which may look dull for some of you. As hunting browning home décor is the theme, then you can also use your hunting item as accessories. Put your antique riffle on display, hung your old hunting vest on the corner of the room. This will make the browning feeling become more authentic. You can also spread several bones in suitable places to accessories the room. Bone can also be used as material, thus if you find several home accessories which made from this material, then do not think second to use them inside the room since it will be cool to have.